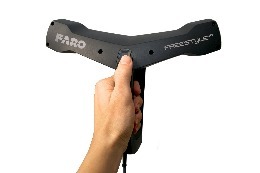 The FARO Freestyle3D is a top-quality high-precision handheld 3D scanner. It quickly and reliably documents rooms, structures and objects in 3D and creates high-definition pointclouds. With unbeatable precision it is suitable for all applications in which installations or properties must be quickly measured from various perspectives. The applications areas of the FARO Freestyle3D are diverse and range from construction to industrial production and forensics. 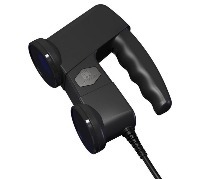 Thanks to its lightweight carbon fiber body, the handheld scanner is extremely portable and mobile. The tablet PC provides intuitive user guidance, even for inexperienced operators. The F5 Short Range 3D imager brings together compact, ergonomic design with speed and ease-of-use to effortlessly capture small, intricately detailed objects, in the field and on the move. 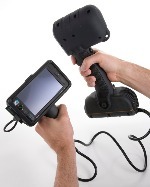 The Mantis-Vision F5 hand-held 3D scanner is revolutionizing the industry. Customers involved in defense, law enforcement and forensics; architecture, engineering and construction; automotive and aerospace; and oil and gas are reaping the benefits of one small, fast, and accurate device for many of their measurement requirements.